This great lamb recipe from the American Lamb Board makes a fantastic pita sandwich. 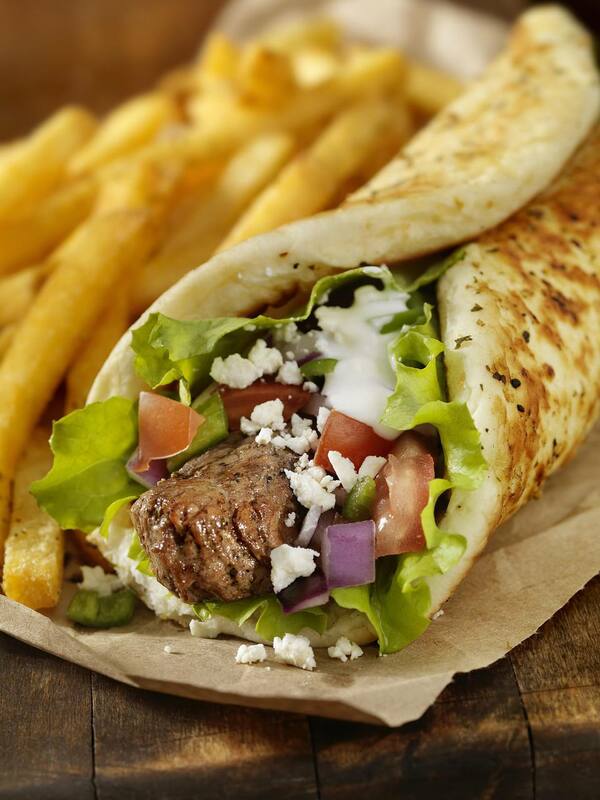 Keep your kebabs the width of your pita so you can simply slide the skewer off into your sandwich. Combine garlic, oregano, lemon juice and olive oil in a small bowl. Season marinade with kosher salt and freshly ground black pepper. Add lamb cubes; toss to coat. Cover and marinate in refrigerator 4 to 6 hours. Drain meat cubes; discard marinade. Thread lamb, tomatoes, and onion onto skewers. Grill on medium heat for 12 to 15 minutes or to the desired degree of doneness; a reliable thermometer should register 145 degrees F (65 degrees C.) for medium-rare, 160 degrees F (70 degrees C.) for medium or 170 degrees F (75 degrees C.) for well. Turn kabobs several times, brushing with marinade. Serve with warm pita bread and Tzatziki sauce. Put all of the ingredients in a mixing bowl and combine with a fork. Refrigerate for at least 1 hour to allow flavors to marry.